It looks like Seth from Seth’s Bike Hacks has been very busy mtb trail building at his new home in Asheville, North Carolina. Seth likes to use his backyard mini loop called Berm Creek to test out new gear, bike setups and even just have some quick after work party laps. Recently, he and his buddies Alex and Bryan got to work on revision Seth’s backyard trail. The crew ended up carving out some bigger berms and built in what Seth is calling the “Sicknik” drop. This baby even has a cooler built into the under side of it for a cold drink or beers after a few hot laps. 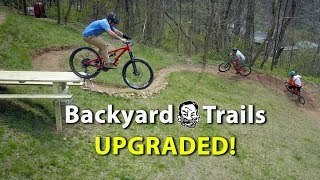 If your shreddy 🙂 to build your own backyard trail or pumptrack pay close attention to see how you well you can maximize riding space in a smaller area! At Seth from Seth’s Bike Hacks house in his backyard.